Legend of Zelda: Phantom Hourglass | Dragon Quest in my Blood! Dragon Quest in my Blood! Posted on 2012/06/27 by christine d.
I really love playing video games. During the days that I haven’t been posting, I’ve been playing more games than you can imagine, as well as fixing whatever is left of my personal life. I recently re-played Legend of Zelda: Phantom Hourglass. To those who haven’t played it, let me give you a synopsis without the spoilers. Basically, it takes place after Legend of Zelda: Wind Waker, where you see Tetra and Link, as well as Tetra’s crew on the ship. As they travel through the seas, they see a ghost ship. Well, as a pirate of the seas, YOU DEFINITELY are looking for adventure. So Tetra decides to get on the ghost ship and explore. Link, worried about Tetra, jumps onto the ship after her. Then the evil powers of the Ghost Ship eats you and Tetra turns to stone. Then you wake up in a beach and with your resolve, you must save Tetra. 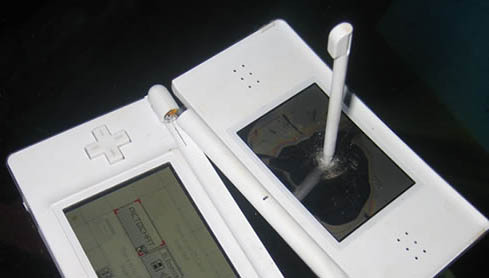 The really awesome thing about this Legend of Zelda game is that, you use the stylus 99% of the time, if not 100%. How you especially navigate through the seas is a hoot by itself. Maybe its because most games I play don’t use the touch screen, even though you can use them. But, using the touch screen is like, a treasure for me. I usually don’t like using the touch screen, since I am a bit paranoid about breaking it or tapping the screen so hard, the stylus would be stuck RIGHT AT THE MIDDLE OF THE SCREEN. Well okay, this isn’t exactly what I thought it would be, but the stylus should be on the touch screen. Like I said, I was pretty skeptical whenever I had to play games that was 100% touch screen reliable. But, I had no choice. I had to play this game because I’m a Legend of Zelda fan and I have liked the design of link in the wind waker series. I’m glad they still have the gorons around, but WHAT THE HECK ARE ANOUKI’S? I never encountered them in Wind Waker, since I preferred the bird-like looking people. Also, flying is fun. It’s your typical ‘let’s rescue zelda while helping save the world’ type of story. Oh, and fairies too. I’d give this game a 7 out of 10 stars. This entry was posted in Legend of Zelda. Bookmark the permalink. Fire Emblem Awakening: Ruffles is here! Fire Emblem Awakening: why is Frederick so strong? Fire Emblem Awakening: are those…. Feet?